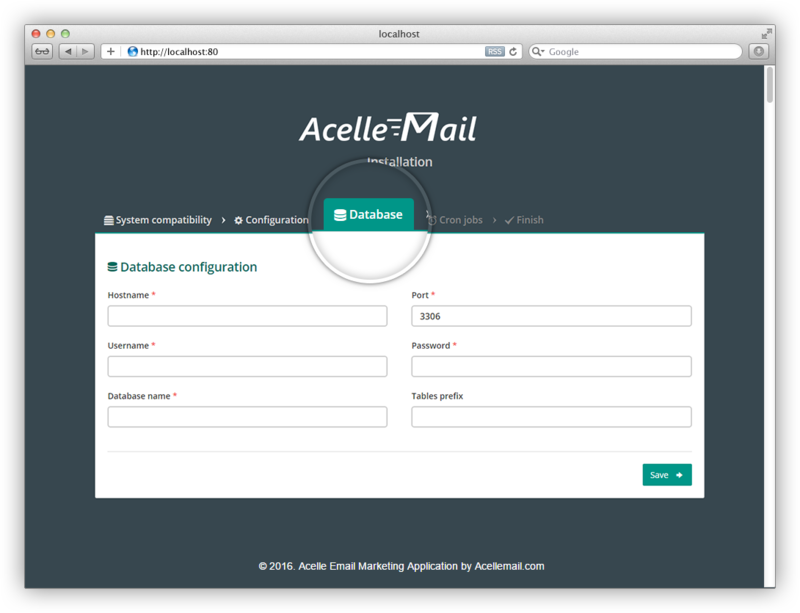 Acelle is a self hosted, full-featured, easy to use email marketing web application that lets you send high-volume marketing or transactional emails through your own server or a 3rd email service provider. 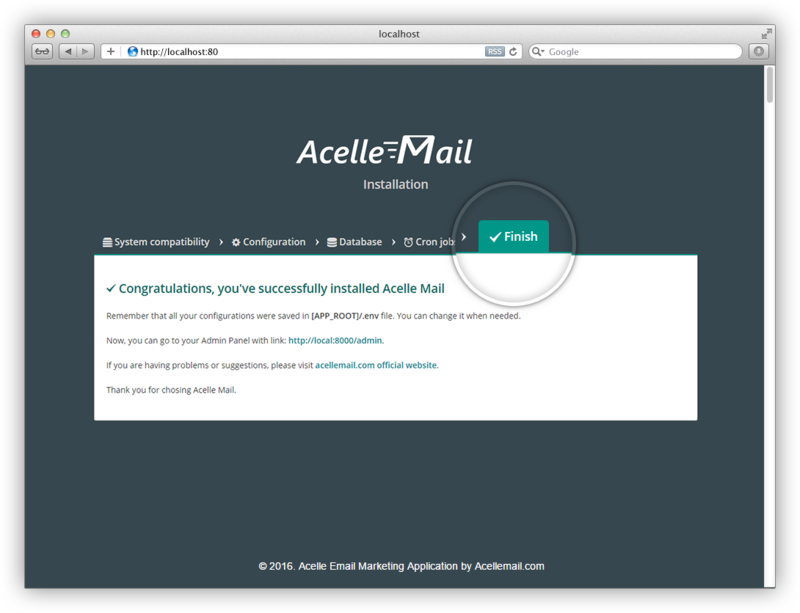 Install Acelle on your own web server and you can use marketing/transaction emails without any limitation. You can get rid of expensive email services like Mailchimp, ActiveCampaign… as you can now have full control over the entire system of your own. Acelle is also made for commercial purposes, allowing you to manage and sell your email services to the others (SAAS - Software As A Service). Developed by: Acelle Co., Ltd.
Now you can access Acelle Mail at: http://marketing.mydomain.com. 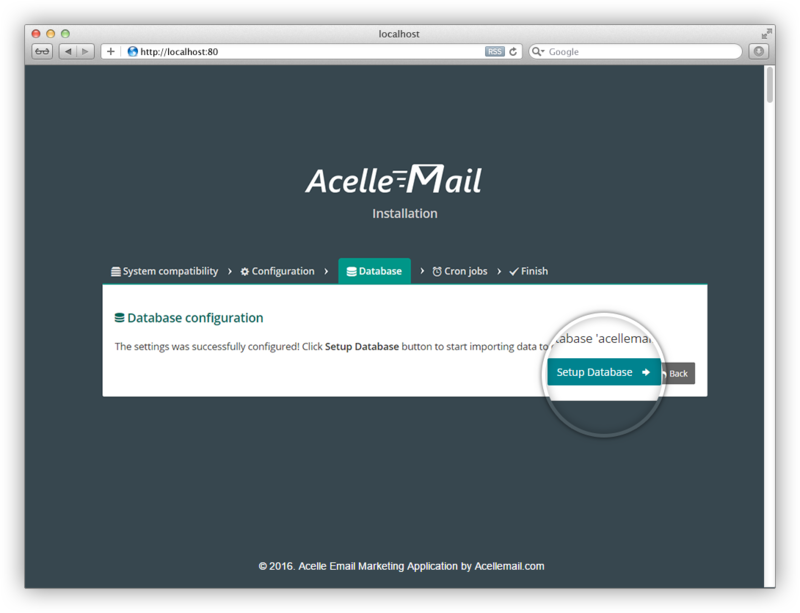 Follow the web installation wizard and you will get Acelle installed on your own host. Note: if you are on other web hosting manager like Plesk, DirectAdmin, Kloxo... the same rules apply. The key is to set Acelle Mail's public folder as the document root of your domain or subdomain. Before installing, make sure that Apache mod_rewrite is enabled and mod_security is disabled. Change the director/file's owner to Apache's running user, to make sure it has proper permission on your source files. If you are on Ubuntu, the default user that Apache runs under is www-data (and it is apache for CentOS/RedHat). 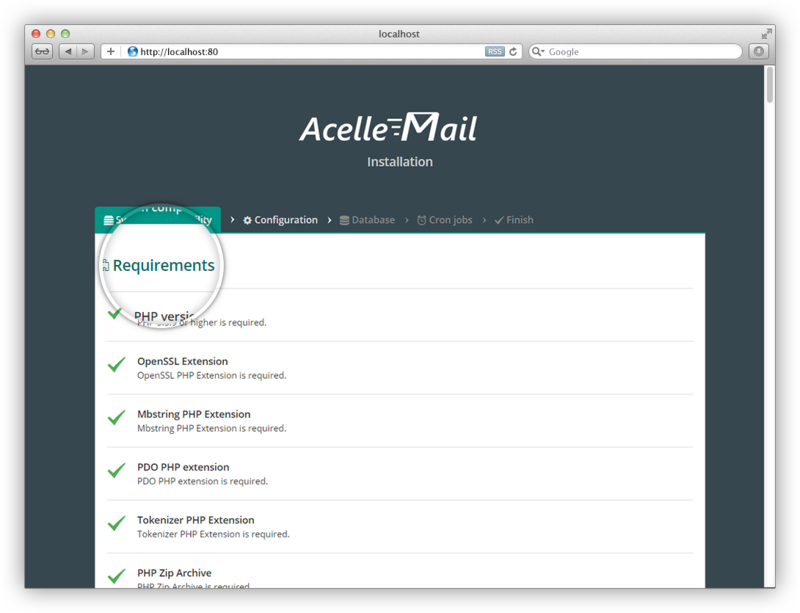 Follow the web installation wizard to get Acelle installed on your own host. 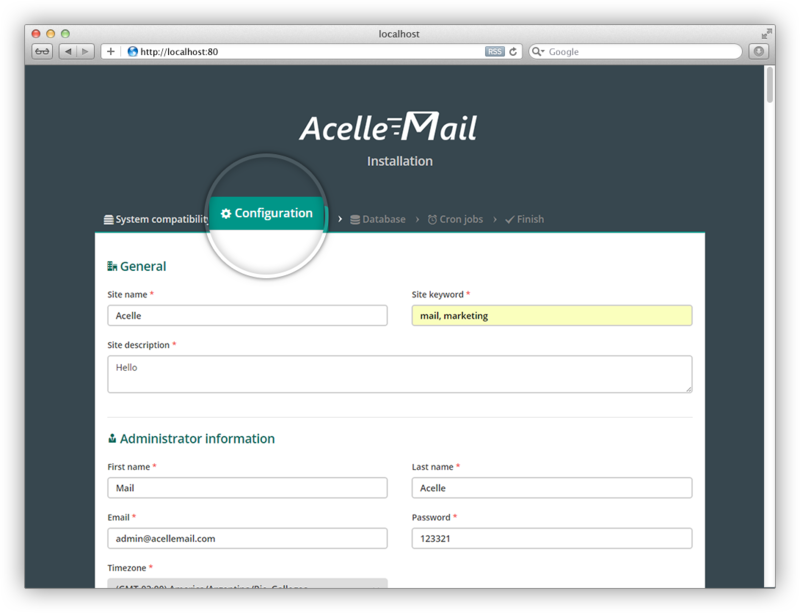 Once you have successfully got Acelle Mail up and running, you can go through the configuration wizard to setup it on your server. First of all, Acelle Mail will check if there is any library missing on the server and will remind you to install it. Once all the dependencies are installed, you can go to the next step to fill in the webapp information. The information can be changed later on in the Administration dashboard. Acelle Mail uses a MySQL database in the background, so you need to have one available. At this step, you need to fill in the database credentials for Acelle Mail to connect to. Once the database connection is established, Acelle Mail will initialize the database with the default settings as well as create the default administrator. 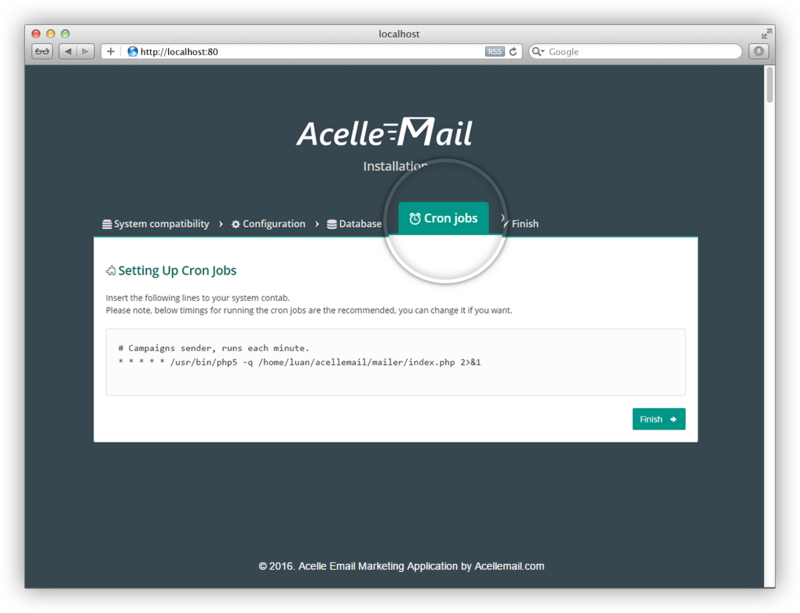 Acelle Mail will generate the cronjob settings so that you can install to your system. Cronjobs are used to trigger the email campaigns as well as other system processes in the background. Remember that Acelle Mail source folder must be writable by the cronjob processes. Acelle Mail supports two different roles for user account administrator and customer. One user account can be of either or both roles. There must be at least one sending server for the system. Go to Sending > Sending Servers, then choose a sending server type to add. Note that both admin and customer (with appropriate permission) can add a sending server, the detailed explanation is covered in our SAAS documentation (Section 2.4). Standard SMTP: send email through an internal/external SMTP service. Sendmail: send email directly through the sendmail program on the hosting server. PHP Mail: send email directly through the mail() function of PHP. Amazon SES API/SMTP: send email through Amazon Simple Mail Service, using either Amazon's web API or standard SMTP connection. Mailgun API/SMTP: send email through Mailgun, using either Mailgun's web API or standard SMTP connection. 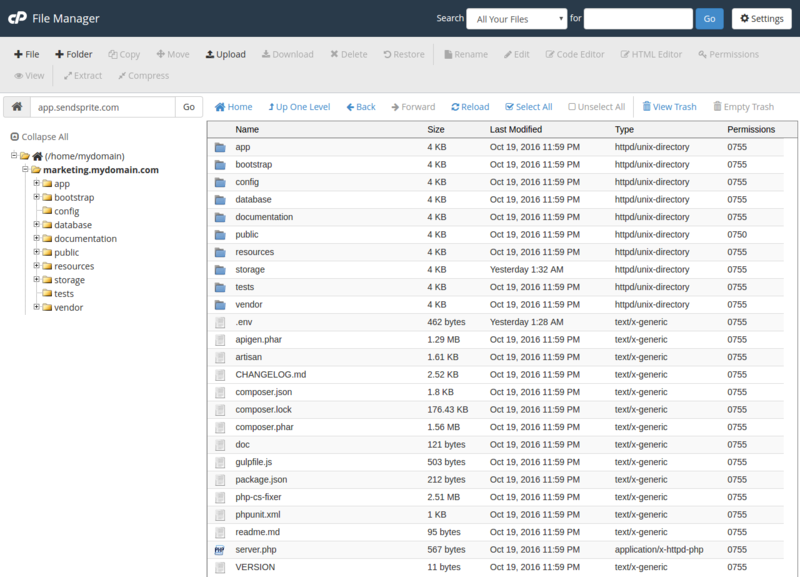 SendGrid API/SMTP: send email through SendGrid, using either SendGrid's web API (v2) or standard SMTP connection. As a customer, you can create a mail list to manage subscribers. Go to Lists > Create List to create a Mail List. Then you can add subscribers to your list (or potential subscribers can subscribe to your list through Acelle Mail supscription form). You can also import subscribers from a CSV file. Once your mail list is ready, you can create an email campaign to send to your list. Go to Campaigns > Create Campaign, choose the mail list to send and follow the steps to setup and send your campaign. That's it! You can always track your Campaign's email delivery status (Sent/Bounced/Open) in the Campaign statistics page. ERROR: The directory [/storage/app] must be writable by the web server. ERROR: The directory [/storage/framework] must be writable by the web server. ERROR: The directory [/storage/logs] must be writable by the web server. ERROR: The directory [/bootstrap/cache] must be writable by the web server. although you are sure the directories are already writable. Then it is very likely that the open_basedir setting is currently enabled on your server, which prevents the application from loading. 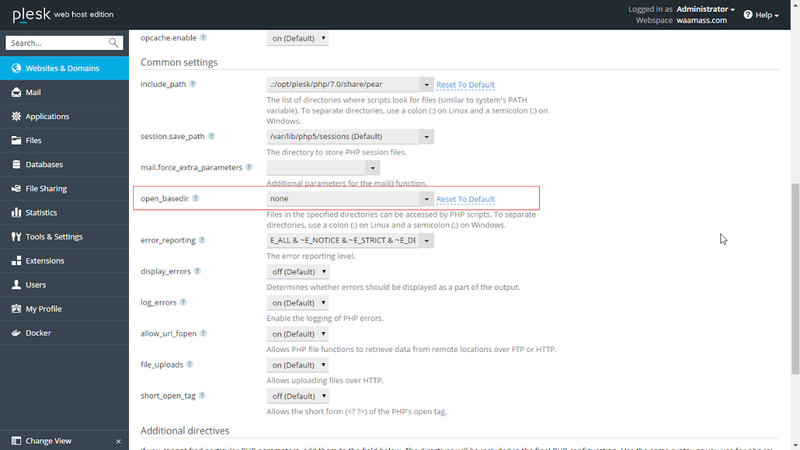 If you are using Plesk, you can go to the domain setting page to turn it off. See the screenshot below, make sure open_basedir is set to none. If you are getting 500 error, it is likely that it a file permission error. If you are on cPanel, make sure that the file/directory permission is correctly setup to 644 or 755 rather than 775. Also make sure that the files/directories permission under the public/ folder of Acelle Mail is correctly setup too. Changing the parent directory permission may not recursively apply to all its children.